TX83A&84 Series are discontinued. As an upgrade substitute, please check out the new TXUN temperature transmitter FM Approved Model for details. See all TXUN Series. Model TX83A is a two-wire current-loop indicator that is powered directly by a 1-5 mA, 4-20 mA or 10-50 mA process loop signal, with a maximum voltage drop of 2.5 V. No separate power supply connections are required. This reduces overall hardware and field wiring costs and provides immunity from most electrical noise encountered in process control environments. The electronics are isolated from the case. 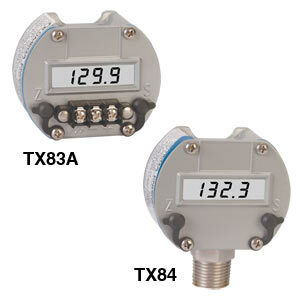 The TX83A provides extensive zero and span adjustment capability, so that it can read out directly in percent or in engineering units for process variables such as pressure, flow, temperature, or level. Its liquid crystal display provides 3 1/2 active digits, a selectable dummy right-hand zero, and four programmable decimal points. By changing two internal jumpers, the normal positive slope response of the TX83A can be reversed, so that increasing the input decreases the reading. Both span and zero are fine-tuned with precision multi-turn potentiometers. These are accessible through holes in the die-cast cover, which are normally sealed with fluorosilicone plugs. Coarse zero and span steps are selected by removing the cover with attached electronics and changing plug-in jumpers. All versions of the TX83A are rated for operation from -40 to 85°C (-40 to 185°F) with specified accuracy. The case is made of die-cast metal and is waterproof to 35 kPa (5 psi). The electronics are firmly connected to the case top, so that the meter can withstand high vibration and shock. Mounting options include a male 1/2 EMT conduit fitting and a male 1/2 NPT pipe fitting in lieu of the normal rail or surface mount. These fittings eliminate the external screw terminals and provide a NEMA-4X rating. FM intrinsic safety certification is standard. Intrinsic safety certification allows the unit to be used in worst-case hazardous environments with no need for explosion-proof housing, provided that an intrinsic safety barrier is used to limit the voltage and current that may be introduced in the hazardous environment. FM certification (USA) is for Class I, II, III, Division 1, Groups A,B,C,D,E,F,G. The FM certification number is 2P1A7.AX (3610:2010). Option EPW3 is a single-height enclosure for one TX83A loop-powered indicator. Option EPW2 is a double-height enclosure for a TX83A loop-powered indicator on top and a TX1500 Series isolated two-wire 4-20 mA transmitter on the bottom for indicating transmitter applications. Available with two female 1/2 NPT pipe fittings, all required internal mounting hardware, and mounting flanges for a wall or bulkhead.